Thierry Henry who used to criticise Arsene Wenger while working as a pundit for Sky hasn’t won any of his five games in charge since being appointed as Monaco’s manager. Wenger came in for plenty of criticism towards the end of his reign as Arsenal manager with the Frenchman leaving this summer after 22 years. Monaco were handed a humiliating defeat on Tuesday that ended the club’s Champions League campaign as Thierry Henry once again failed to secure a maiden win as coach. Monaco, a semifinalist in 2017, slumped to a 4-0 home loss to Club Bruges, who registered their first win in four Group A matches. Hans Vanaken scored twice for the Belgian team, Brazilian forward Wesley made it 3-0 and captain Ruud Vormer completed the rout. 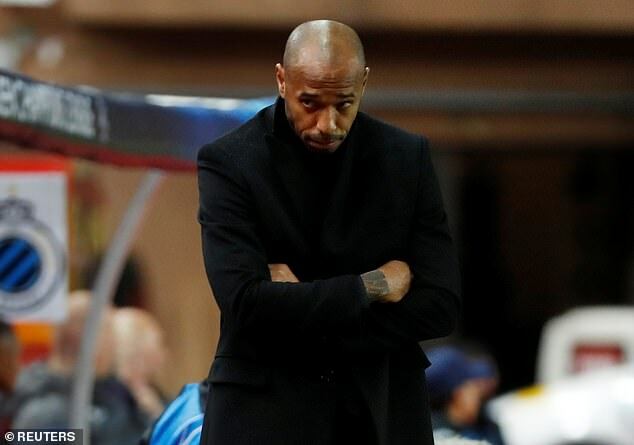 Henry was hired last month as a replacement for Leonardo Jardim but has yet to secure a win in five matches, with his team stuck in the relegation zone in the French league. The former World Cup winner is in his first managerial job after working as an assistant to Belgium coach Roberto Martinez. Henry who was vocal in his criticism of Arsene Wenger last season thought he learnt from Pep and was too good to learn from Wenger, now understands what coaching is about. He’s learning from experience now.